It seems I should apologize that my recent article contained a statement that I now notice is inaccurate. Unfortunately, I neglected to sufficiently take into account the fact that voting is a human endeavor. Keeping in mind the humanity of voting is something I have tried to do from the very beginning of this series of articles, but in this instance I failed, probably because I briefly put on my statistician's hat and that caused me to temporarily remove my voting hat. BRV and BAV provide essentially the same information. This is the statement that wilts under careful scrutiny. BAV you may recall is an acronym for Balanced Approval Voting, where a voter casts (or chooses not to cast) an opinion about each candidate, either to approve or disapprove. What motivated the use of BRV (Balanced Randomized Voting) was to capture the apparent advantages of BAV in measuring voter opinion while accommodating an election with a very large number of candidates. While BAV tries to directly interrogate the opinions of each voter about each and every candidate, the approach with BRV is to take a large random sample of voter opinions about each one of the candidates but this is done by asking each voter about only a single candidate. 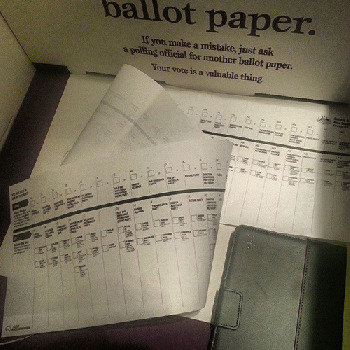 In this system, the voter receives one of many possible ballots, each ballot asking about only a single candidate chosen at random, with each candidate having an equal chance of appearing on a given ballot. At first glance, it may appear that BRV is inherently inferior to BAV but given a familiarity with statistics it might seem (as it did to me) that, given a sufficient number of voters, these two systems will produce identical outcomes. But in truth, the two systems can actually produce quite different outcomes and that is because (with human voters), as the number of candidates increases, BAV degrades in its ability to measure voter sentiment while BRV does not degrade at all. When there are many candidates, BRV in facts becomes the much superior voting system. The human factor becomes critical because this would not be the case if the voters were machines rather than human. It is an important consideration that humans suffer from fatigue in a way that machines do not and fatigue affects BAV in a way that it does not affect BRV. Given a hundred candidates, the MEGLO effect (My Eyes GLaze Over) will cause many if not most ballots to be filled out only partially; voters will surely not bother to express their opinions about all of the candidates. Consequently, BRV becomes a better measure of voter sentiment than BAV can be. Even with very many candidates, BRV manages to take a meaningful measure of voter opinion regarding each and every candidate; with only a single candidate on their ballot, perhaps a candidate with little exposure by the media, a voter may feel at a loss how to vote or perturbed about not being able to express an opinion about the candidate(s) of greatest interest, but MEGLO cannot be a problem. The perturbed voter's response is still likely to be the honest one even if the response is to neither support nor oppose the candidate when the voter has no opinion. In this way, a meaningful sample of voter opinion for each candidate is collected, even the candidates that the media considers not to be viable. In contrast with BAV, some candidates might well be ignored by all but an insignificant sample of voters (though surely their best friends and worst enemies will cast an opinion). The fact is that, faced with a hundred or more candidates (and probably with even just 15 or more), most voters will just not conscientiously fill out the entire book-length ballot. Instead they may fill out only the portions relating to candidates they feel strongly about. Or they may instead limit their responses to just the few of the candidates they judge to be most likely to win; probably it will be some combination of these very related considerations. Sadly, after the election it will be difficult to interpret the ballot count as to whether the non-votes are due to fatigue or to actual indifference about the candidate. My error of equating BAV with BRV results serves as a good illustration of the importance, in regard to voting, of taking account that it is a human activity. Just as fatigue is important, the phrasing of questions and the simplicity and appeal of a ballot has to be weighed. Abstract thinking about voting (that ignores the human aspects of the activity) can be useful and important, but ignoring factors that only seem unimportant can lead to serious mistakes. Abstract reasoning needs to be tempered with consideration of how actual humans are likely respond and ultimately with real-world experience. The importance of trials for different voting systems is surely needed to find out how actual voters do in fact respond. Unfortunately, anything less, though very useful, is at best educated guess-work. Given the elections we are accustomed to, it may seem a bit odd to worry about elections with a large number of candidates. In our general elections (which are the elections that get the most attention) there are typically only two candidates of any interest; if there are more then we know to just ignore all of those minor party candidates and just focus on the two candidates from the two major parties. The worry about many candidates rises out of hope much more than from experience. In this series we have seen that balanced voting systems will stimulate the entrance of more candidates for us to choose from. But even with general elections so restricting our choices, our primary elections often do have many candidates for us to choose from. At least in the primary elections, why can't we use a voting system that can sensibly accommodate that larger number of candidates? The primary elections are truly so very important precisely because we have so few choices in the general election. The primaries are where we actually do have a choice greater than between tweedle-dum and tweedle-dee. Continuing to use plurality voting in the primaries is much more of a mistake even than continuing to use plurality voting in the general elections. For some reason, this article did not get added to my series of articles on Balanced Voting. Since I did refer to the series in the article, I am adding this link as a comment. In the previous article of this series we saw how theXMAV voting system put a voter in a quandary about how to vote. It is worth considering how much more difficult the situation is for the XMAV voter who is faced with a hundred candidates. With XMAV the voter is forced to express an opinion for or against each and every one of those candidates.